We’ve known for some time that Mercedes-Benz will be building a mid-sized pickup truck in the near future. Or at least, they’ll rebadge a Nissan. But this week somebody seems to have actually spotted the thing cruising around Germany. This video identifies the vehicle as a “GLT,” which some journalists (including myself) have speculated the name might be. I mean it makes sense, right? But as it stands Mercedes has not released an official name for the truck. I’ve also heard “X-Class,” for what it’s worth. 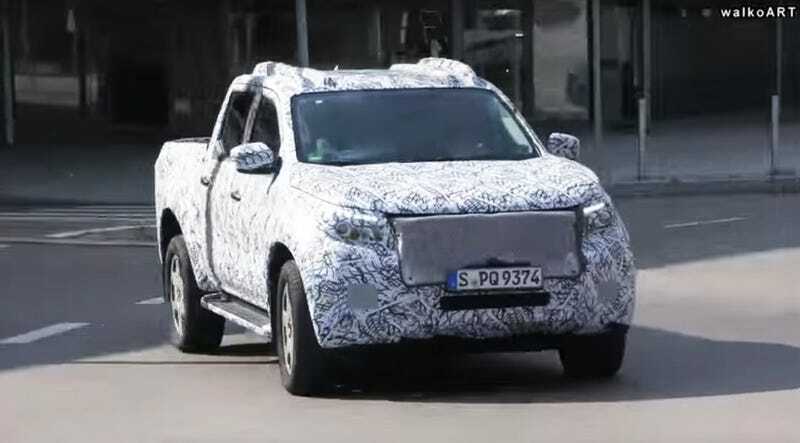 But we do know the Benz truck will be built on the Nissan Navara platform, which is effectively the Nissan Frontier in every country except the United States. The Navara and Frontier have been effectively identical until recently, when the Navara got a fresh facelift and our Frontier just kept on trucking with the same face it’s had for over a decade. We’ve pressed Nissan on what they plan to do with the American market Frontier but so far the only answer I’ve been able to get is a vague statement that the U.S. truck will not look like the globally-sold Navara. Rumors have gone both ways: “the next Frontier will be tiny,” “the next Frontier will be the Navara.” Honestly seems like even Nissan isn’t sure what the future of its U.S.-market mid-sized truck is. It probably has a lot to do with the success of their finally revamped Titan . As to what exactly Mercedes plans to change about the Nissan platform, that remains a little mysterious as well. In the first (and apparently only) official statement Mercedes has released about its truck, they claimed it would have a payload capacity of “about one metric ton.” That’s 2,200 pounds, a very impressive specification for a mid-sized truck, at least in the U.S. market. Abroad, it’s much more common to see single-cab tray-back trucks based off mid-sized platforms and their carrying-capacities get much higher than ours. Whatever they end up calling it, I think it’s highly unlikely Mercedes will sell this vehicle in the U.S. for the same reason we don’t get the work-spec G-Class or cloth-interior trims of anything else. Too much brand dilution for us superficial Americans.